This painting is now sold. The buyer now has the option to reveal who they are and sell it. Good luck, buyer, and thank you! 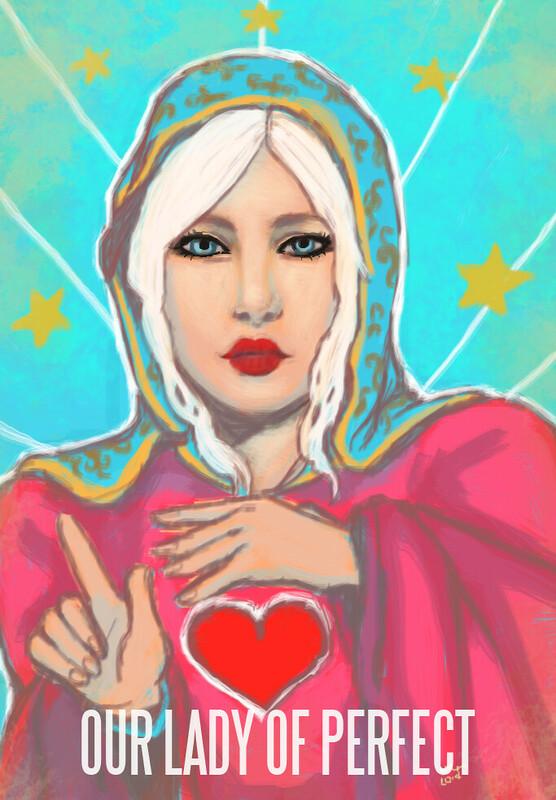 “Our Lady Of Perfect” is a digital painting of Juicy Littlething of the blog Juicybomb. There will only be one painting object created in SL. This picture, with the watermark, can be shared on blogs if you want to talk about it. The real painting will not have a watermark. With the rise of gatcha resale shops in Second Life, Gogo and I would like to see who’s willing to pay what for one-of-a-kind collectible items. This item will be no mod/no copy/transfer. That means if you want to buy it, raise the price, and resell, you can. We’re interested in how far this goes. If you even decide to just buy it and keep it for yourself, go for it! That’s also information worthy of us knowing. Read the rest on Aemeth’s Flickr. i personally don’t like the painting…..